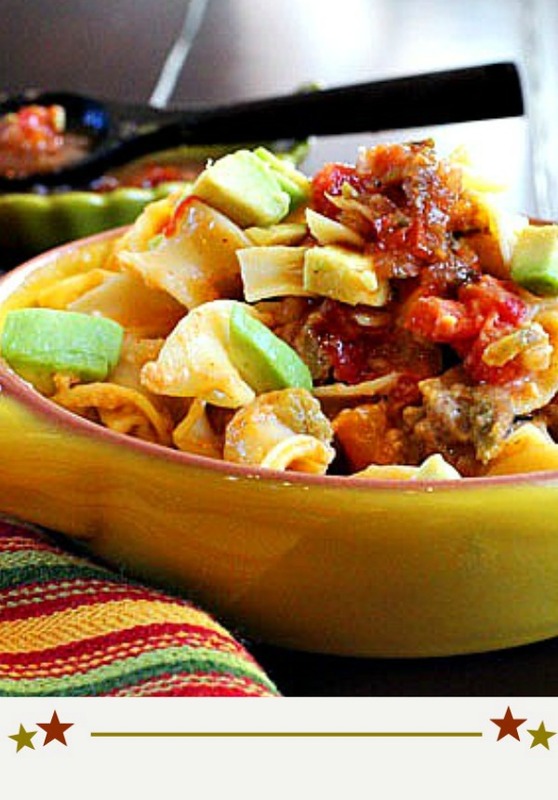 A hearty Mexican breakfast casserole with egg noodles and sausage. Easy and cheesy. Everything you’d expect in a casserole dish like this, a one pot meal that’s great for a hearty breakfast to feed a crowd. Is there any noise in the kitchen more satisfying than the sound pasta makes when you’re stirring it together with saucy ingredients? 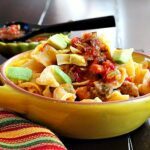 Those ingredients for this Mexican Breakfast Casserole include egg noodles, sausage, cheese, cream of mushroom soup, milk, Hatch chile peppers, tomato, avocado….all baked into a creamy treat. Rude awakening. We had our first Summer snow storm last Thursday. 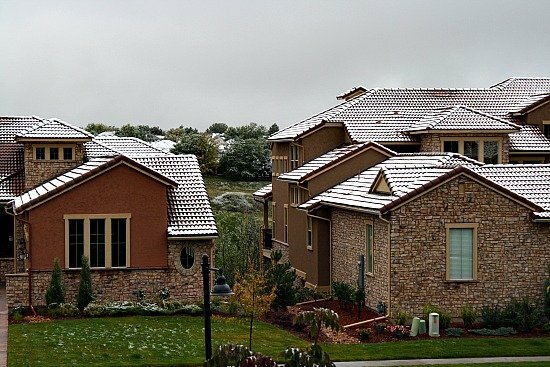 Wednesday night we went to bed with temps in the 70’s and woke up Thursday morning with low hanging thick clouds that decided to drop some icy snow to stick on our green grass, trees and rooftops. Oh, it didn’t amount to much according to Colorado standards, but it was a shock to our flip-flopped feet. Absolutely perfect excuse to drag out the pasta, the cheese and the casserole dish. Side note, we’ve been back in the 80’s ever since this little front moved on through. After the noodles were drained and back in the French oven, I simply topped them with everything that was to go in the casserole. Even two whole eggs, which I should have lightly beaten, but was feeling frivolous. After a good stir to make sure all ingredients mixed together evenly, I popped the pan into a 350 degree oven for about thirty minutes until everything was nice and bubbly. This was everything you expect in a casserole of this type. 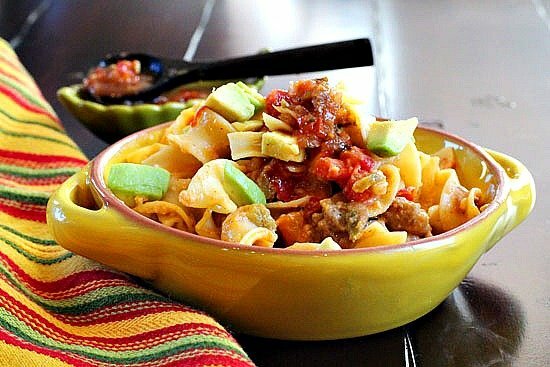 Creamy and cheesy in texture, spicy with Fall flavors of Hatch green chile and chile powder, savory with sausage and sweet with tomatoes and orange bell pepper. Topped with chopped avocado and homemade salsa, we definitely had seconds…and thirds. 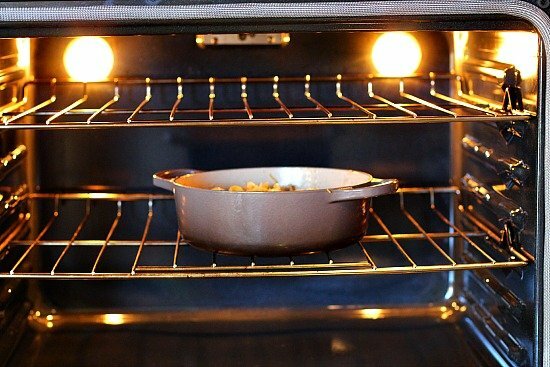 Cook pasta according to package directions in an oven proof casserole. 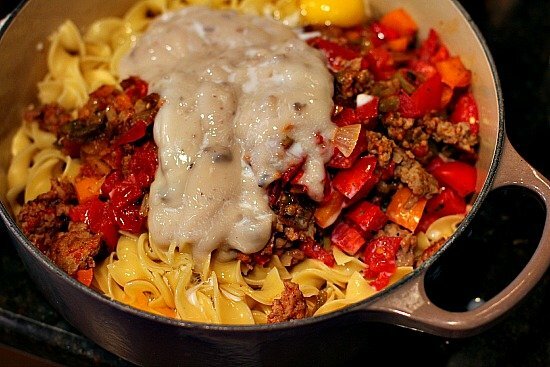 While pasta is cooking, saute sausage, onion, and bell pepper in a skillet. Drain sausage mixture. Drain pasta and return to casserole. Top with remaining ingredients and stir well. Sprinkle top with a little more grated cheese. Bake in preheated 350 degree oven for 20-30 minutes or until cheese is melted. Serve topped with salsa and chopped avocado. Mexican Breakfast Casserole …It’s what’s for Breakfast. Well yum! We have had some chilly mornings but no snow in the valleys so far. Still it has brought on the comfort food cravings. This looks like a nice dinner,too. And is that a brand new shiny oven I see? Our new house is one year old and I think the guy who lived here never used it (bachelor) I LOVE that. 🙂 And plus I have double ovens. LOVE that. 🙂 One of these days I’ll post a photo of the kitchen. Hi Lea Ann, what a great casserole, such a comforting dish, ready for the cold weather. Nice recipe for that very yuckky day. Hopefully we are going to have a good Indian summer. By the way, that oven is way too clean! Yup, it snowed. And it was like that for two days! We did get a frost but all outdoor plants survived. Great brunch recipe. Snow seriously. I haven’t talked to my SiL (live outside Boulder) so I had now idea about the snow. We had a great fall day yesterday, but back to summer temps today, I believe. Did I ever tell you my Sister lives in Tulsa? We’ll have to talk about that someday. What a comforting breakfast and it looks colorful and delicious. I can’t believe it snowed and now it’s back in the eighties. Wow, Mother Nature is being naughty. Mother Nature is simply being ornery! But what a great excuse for a breakfast casserole. Thanks Sam. It has been pretty chilly here also with morning temps in the upper 30s to low 40s. Not good for tomato ripening, that’s for sure! Your breakfast casserole sounds so warm and delicious – perfect for an autumn day! Susan, I’m still nursing along tomatoes that hopefully will ripen over this week. We’re back in a heat wave for now. Lee Ann, I love Mexican and breakfast. But does this dish have to be limited to breakfast?! Just wanted to let you know I printed this out so this is happening! Think we’re doing for breakfast for dinner – cannot wait for this! Thanks Pamela! Let me know how you like it. This looks like the perfect comfort food to face our changing weather. That dip in temps last week prompted me to make spaghetti and meatballs- so good- somehow pasta dishes were just what the weather called for! We thought it was perfect. That cold weather had me grabbing for the pasta. Thanks Holly. Very creative Lea Ann! Looks so delicious! I want to come over for breakfast now!!! Snow already? I am so not ready for cold weather! This would be the perfect breakfast to wake up to though. Yup, snow! Too early and I want to relish in all this lush Summer rainy weather. This looks wonderful. We must have been channeling some sort of spicy breakfast spirit because I did a spicy breakfast idea this week! We’re probably a week or so away from our first snow! Yikes! Where did the summer go??? We’ve got some warm temps predicted for this next week, but I’m afraid you’re right. It’s right around the corner. I loved our burst of cold weather!! I was all excited 🙂 As you know, I’m not much for hot weather! This looks wonderful Lea Ann! Perfect for our fall temps, though lately it’s been a bit hot for fall, personally! I’m in your neck of the woods almost every Sat, come and see me one day. I’m loving all of this rain last night and this morning. We’re really getting a lush treat this season. Nice to hear from you Nazneen. This looks delightful! Welcome to almost Fall and the beautiful crisp air ( sometimes snow) weather. Our feet sre still flip-flopped and will be well into October (sigh) here in north Florida. I’ll soon be envious of your warm temperatures Velva. I fear we’re going to have a very snowy Winter season. This is going on my list of things to make with the bounty of green chiles we’ve got. Sausage, egg, and chiles? Heck yes! Wow! Printing this out as I type Ü I just got my roasted green chiles all cleaned, bagged and ready for winter consumption. Two bushel for $30 off I-70 and Sheridan….I don’t think four bushel will hold me, though Ö Can’t wait to try your recipe. Thanks for sharing! Wow! This recipe looks amazing! Printing it out as I type. I just finished cleaning, bagging and freezing my roasted green chiles. Two bushel for $30 off I-70 and Sheridan. I’m now debating whether the 4 bushel will get me through our winter consumption….especially after seeing your recipe! Thanks for sharing!! Quite an assortment of food preparations, delicious to behold, even more to the taste, it must be. Beautiful pictures also graced the site! Impressive Lea Ann! How I wish to come dine too! Your blog is truly a store of information. Please keep it going!